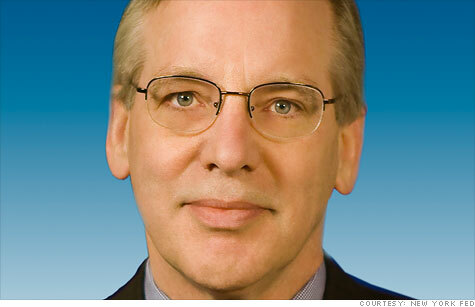 William Dudley, president and CEO of the Federal Reserve Bank of New York. NEW YORK (CNNMoney) -- The head of the New York Fed continued his push for more aid for homeowners Thursday, stressing the central bank is not yet "out of ammunition." "We cannot be satisfied with the current state of the economy or the outlook for the next few years," said William Dudley, president of the Federal Reserve Bank of New York, in a speech at the U.S. Military Academy in West Point, N.Y.
Dudley stressed that helping the housing market may be the best way for the Federal Reserve to intervene in the economy. Buying more mortgage-backed securities, he said, is one potential option. The Fed has already used its traditional tools to help the economy. By keeping interest rates at record lows since December 2008, it tried to make borrowing money cheap and spur spending from both businesses and consumers. So far, those low interest rates have not been potent enough though to get the economy fully out of its slump, and since the Fed cannot lower rates any further than zero, it is stuck in a bit of a quandary. That's why the Fed also launched two rounds of major asset purchases, known as quantitative easing, and recently initiated a program known as Operation Twist, as a way of bringing long-term interest rates, including mortgages, even lower. In his speech on Thursday, Dudley made it clear that he believes the economy still has a long healing process ahead, and could need yet another boost. "I am deeply unhappy with the current forecast of prolonged high unemployment," he said. Dudley also cited statistics that show about a quarter of homeowners who have outstanding mortgages are currently underwater. He stressed that monetary policy can only do so much to help, and urged housing regulators and lawmakers to consider complementary policies to further aid homeowners. The government, for example, could unload the foreclosed properties it now has on its books, for conversion into rentals, he said. That's a policy the Federal Housing Finance Agency is currently considering. Dudley also applauded the FHFA's recent decision to help some homeowners refinance at lower rates. Dudley's comments come during a week filled with speeches from his Federal Reserve colleagues, many who disagree about what action the central bank should take. Speaking just two days earlier, Dallas Fed President Richard Fisher, who has opposed more monetary stimulus, gave a more encouraging outlook on the economy, while Charles Evans, president of the Chicago Fed, urged his colleagues to focus on fixing the struggling job market. Dudley urged outsiders to not view disagreement within the Fed as a cause for concern. "Because reasonable people can differ over the costs and benefits of further action, you should not be surprised that there is vigorous debate among FOMC participants," he said. The Fed's policymaking committee is next scheduled to meet on Dec. 13.